Perhaps some of the most abundant components industry wide are bearings, more specifically rolling element bearings. These bearings are found in everything from electric motors to gearboxes and conveyor systems. Basically, if a shaft needs to spin, it can be (and most of the time is) supported by a rolling element bearing. What some people fail to realize is the actual makeup of these devices can be quite different based on the application. Rolling element bearings are composed of two races separated by a group of rollers. The shape of these rollers determines the load a particular bearing can hold as well as the lubrication requirements. The first type of roller we will discuss is one of the more common types - the ball bearing. Ball bearings come in as many sizes, materials and finishes as can be imagined. This provides incredible flexibility in their use. 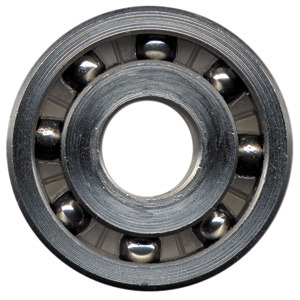 The balls in these bearings simply roll between the two races, and it doesn’t matter which direction the elements are facing. As their name suggests, cylindrical roller bearings are cylinders that are arranged between the inner and outer races. These cylinders, which are shaped like soda cans, roll along their sides in the tracks of the races. The elements can only roll along a single axis, unlike balls which can roll in any direction. Spherical roller bearings are very similar to cylindrical roller elements with one exception - they are rounded around their midsection. Instead of being a perfect cylinder, spherical roller bearings are rounded so the sides of the cylinder are no longer parallel to each other. This gives them more surface area in contact with the race than a cylindrical element of the same length. Needle roller bearings are smaller in diameter than the previous examples, but they also have more length. These elements are perfect cylinders but are stretched to the point that they resemble needles. Although small in diameter, they make up for the surface area in the length they span. With tapered roller bearings, one end of their elements has a larger diameter than the other. This gives them a slight conical structure and enables the elements to roll along a diagonal plane. The angles created by these elements allow them to withstand both axial and radial loading. All of the above types of elements come in several different arrangements. Some bearings have only a single row of elements, while others employ multiple rows. Cages are used in certain bearings to separate the elements and keep their spacing constant. Seals are another item that can be customized on bearings. All of these features make a difference in the bearing’s functionality as well as its life expectancy. Rolling elements undergo a lubrication regime known as elastohydrodynamic lubrication. In this regime, the fluid film is usually less than one micron, and pressure up to 500,000 pounds per square inch isn’t uncommon. The oil momentarily turns into a solid and elastically deforms the rolling element and the mating surface. Any contamination can interfere with this process with devastating results. Particles present in the load zone cause surface degradation of the mating surfaces and can lead to the generation of more wear particles. Oils have a property known as the pressure-viscosity coefficient. This is a measure of how well they can momentarily turn into a solid. Water does not have this property and thus can lead to boundary conditions when it is present in rolling element bearings. It is important to monitor water levels in the lube oil to keep this from occurring. In some cases, bearings can lose 70 percent of their life because of water before the oil even gets cloudy. There are two types of loads that bearings undergo: radial loads and thrust loads. Radial loads are experienced as shear forces. These loads occur across the races of the bearing, as opposed to thrust loads, which are forces that push into the face of a bearing. In other words, the radial load of an electric motor would be found by any load pushing the shaft of the motor up or down, while the thrust load would be any load pushing the shaft back into the motor. The amount and type of loads your bearing is experiencing determine the type of bearing you need, as well as the rolling elements within it. Understanding the basics of how rolling element bearings work and their design can help you achieve added reliability at your plant. Determining the type of loads you wish the bearing to handle as well as the ambient conditions will further assist you in the selection of the proper bearing. The possibilities for bearings are endless, so you can guarantee there is one that is perfectly suited for your application.